We have a staggering amount of input data for the game. While this allows us to finetune the game to high degree, this can be more than a bit frightening. Some options are set at the campaign start screen. They are stored in the savefiles and cannot be changed later on (apart from debugging or hex-editing). 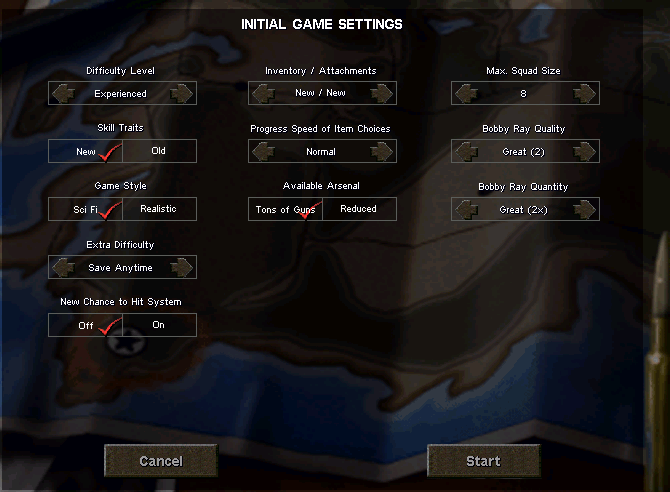 Some options are set in the game options screen. They are read and written in the Profiles folder and are savegame-independent. Most options are set in JA2_Options.ini or the myriad of other inis and xmls we have. They are savegame-independent. those that are used to set up savegame-stored data that cannnot be changed later on. This includes squad size, max number of team members, iron-man settings, long-term quest things... We could theoretically change the code so that all these can be altered as well (or we can already do so but don't want due to story-related reasons), but for now, let's just assume they cannot. those that are used to control features that can be changed at any point in the game. This is the vast majority of options. we have options that set up savegame-stored data but are not set up at the campaign screen. As a result, changing them in the ini leaves us no choice but to throw an error (best example: MAX_NUMBER_PLAYER_MERCS in JA2_Options.ini). we have options that can be changed at any point in time codewise (even ingame), but we cannot do so. Examples: Food, NCTH, improved interrupt system... half the start screen, really. As a result, if a player comes to the conclusion that he doesn't like the choice he made earlier, he has to start a new campaign or learn how to hack this. I am fully aware that this might be controversial for some people. Though given that with most SCI releases there are options changed in the ini, I'm not that sure why adapting an existing campaign to a new ini should be an unusual effort. As said, I will continue to move settings in this manner and will list these changes in this thread. I am also aware that having some settings in the ini and some settings in DifficultySettings.xml is unusual. I've personally ranted more than a bit about that, no need to explain to me why you feel that is an odd design choice. People who might want to complain about us having so many options everywhere might bear in mind that they are often the same people who request for more stuff to be externalised. As of r8622, IMP slots are now purely defined by <Type>6</Type> in MercProfiles.xml. Removed MAX_IMP_CHARACTERS and IMP_XXX settings. That's right, we no longer have any IMP slot settings in MercProfiles.xml, all you need is to set which slot in principle can be an IMP slot and you can use it. I've taken the liberty of setting that on any other free slot in the trunk, which gives us ~29 possible IMP slots. This is the maximum liberty we can have with those slots. We have to define them somewhere. Why those slots weren't free to IMPs in the first place... no idea. It would have been possible in the old code as well (apart from the nonsensical max IMP at the starting screen I guess, which is now gone). I briefly pondered also allowing slots with <Type>0</Type> to be IMPs - this would retroactively unlock those slots for IMPs in older saves - but for some reason I'm getting fragments of the xml-read profiles over unused slots in the savefile, so let's not go there for safety.